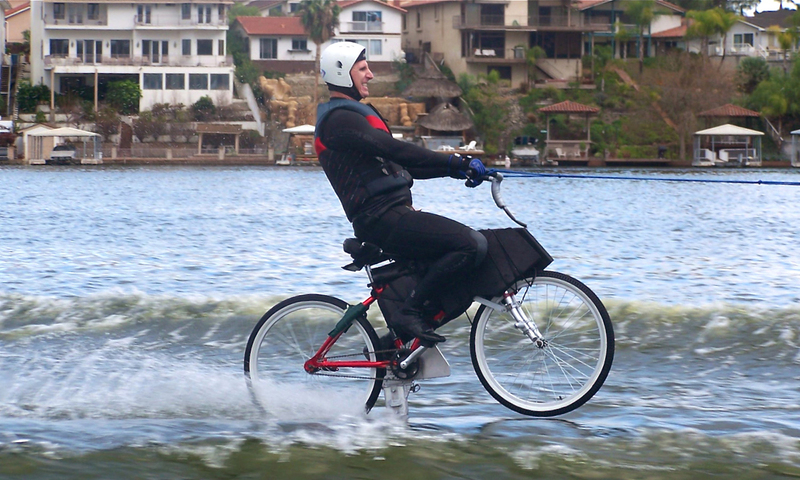 The Hydrofoil Bike was a proof of concept project for a Powerade commercial. The idea for the commercial was to have a guy on the beach drink some Powerade, and the colored liquid is so amazing that he is able to hop on a bike and ride it across the water! The actual project to get this bike to fly took 5 days. Klarich got up on the bike using the pegs on the front tire as footrests. A deck similar to a regular sit down hydrofoil was in place until flight, then after pulling a pin it split in two lengthwise to release from the rig.